Carlo Enrico is president of Mastercard’s Latin America and Caribbean (LAC) region and a member of the company’s management committee. Carlo is responsible for leading Mastercard’s strategy and operations across 45 countries and territories, and driving transformational efforts across digital payments, financial and social inclusion, products and services. After joining Mastercard in 2012, Carlo served in several senior roles. These include Division President for Central Eastern Europe and, most recently, Division President for Western Europe, where he was responsible for overseeing Mastercard operations in Belgium, Luxembourg, the Netherlands, France, Portugal, Italy and Spain. 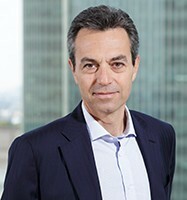 Prior to joining Mastercard in 2012, Carlo was CEO of BancoPosta, the financial services division of Italian postal services provider, Poste Italiane. He has over fifteen years’ experience in the financial industry, holding senior roles at Banco di Sicilia, Capitalia Group and Goldman Sachs. Carlo has extensive experience in leading large teams, managing a diverse customer base, and developing and integrating strategies that drive revenue. Carlo graduated from Bocconi University, Milan, Italy.